How many times a year do you see a patient on average? Once? Twice? By creating and posting targeted social content, we help you keep an ongoing relationship with existing clients while attracting new client leads. Everyone’s doing it. Stay relevant and top of mind with the right social strategy. Being active on social media is about more than auto-posted dental articles and cat memes. For social media to work for your practice it needs to be authentic. That’s why our social strategies are built around high-quality, personalized content that showcases you, your team and your community. Beautiful design and targeted advertising come together to create one of the most cost-effective ways of getting in front of the people who matter. In fact, one of our most effective strategies is targeting your existing patients through Facebook and Instagram to generate social referrals. Our team takes the hassle out of managing multiple accounts, and brings an expert eye to the design and storytelling of your posts, helping you stand out from the crowd. We’ll collect professional photos, before and afters, and candid shots and videos from your office to enhance your follower’s experience and start engaging potential patients. We place an emphasis on unique, personal content that your audience can engage with, and create content that feels like its coming from you and your team. Social media works when content is authentic and meaningful. Staying on top of the ever-changing algorithms and intricacies of social media is a big ask for you and your team. 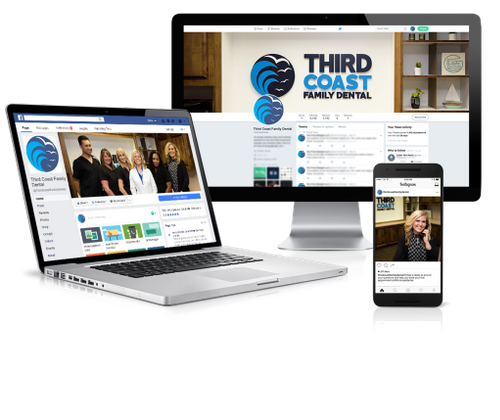 We take the stress out of social by building a strategy that we execute, so you can get back to dentistry. We build targeted audiences and A/B test our ads to make sure we are reaching the best demographic with the strongest message. Best of all, results are all tracked in an easy to read reporting dashboard. Perfect for practices that are just starting to get active on social media, and want to increase social reach and engagement. Great for practices that have a modest following, but want to push content further. For clients who are ready to interact with their patient base, encourage and request follows, and work on building a community for us to engage. Ideal for practices that are comfortable taking photos and posting them on social, but don’t have the technical knowledge to manage advanced social ad campaigns. We’ll handle the boring things while you tackle the fun stuff. Build and engage your community with beautiful, relevant content. Want to learn more about our social campaigns? Let’s set up a time to chat. Interested in working with us to grow your social media? Let us send you a proposal with pricing.